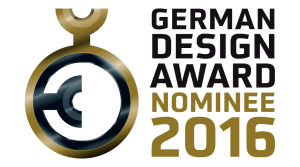 QLIPP is proud to announce that we have been nominated for the German Design Award 2016! Following our successful debut in Germany at ISPO Munich 2015, our QLIPP Ultimate Tennis Performance Sensor has once again received attention for its unique design and potential. The German Design Award presented by the German Design Council is widely known for the prestige and recognition conferred to its invited participants, stemming from its rigorous selection process. This highly esteemed international competition identifies and honors designs that display exceptional quality, and significantly raises the visibility of these outstanding designs from their respective fields. Due to the stringent judging standards and processes imposed, this annual competition has two distinguished titles that are widely recognized internationally, namely the Excellent Communications Design and Excellent Product Design. We are delighted to be one of the nominees of the Excellent Communications Design award 2016. With a panel of judges comprising of design experts from Italy, Switzerland, Sweden, Hong Kong and many more, it is definitely an honor to be able to showcase our product on such an elevated stage. We would like to give our heartfelt thanks to everyone for supporting us thus far. Also, to be a step closer to owning your very own QLIPP sensor, be sure to sign up and be a part of our priority list today!